Analog and Hybrid Computing focuses on the operations of analog and hybrid computers. The book first outlines the history of computing devices that influenced the creation of analog and digital computers. The types of problems to be solved on computers, computing systems, and digital computers are discussed. The text looks at the theory and operation of electronic analog computers, including linear and non-linear computing units and use of analog computers as operational amplifiers. The monograph examines the preparation of problems to be deciphered on computers. Flow diagrams, methods of amplitude scaling, estimation of values and frequencies, and scaling of higher order equations are described. The text also looks at the organization of computers and checking of problem set-ups, including interconnection of units, control of problems, and setting of potentiometers. The book also discusses solutions of variable coefficient and nonlinear differential equations; simulation of linear transfer functions; and iterative operation of analog computers. The text offers information on hybrid computing, including hybrid computing systems, applications of hybrid computers, and a generation of hybrid computers. 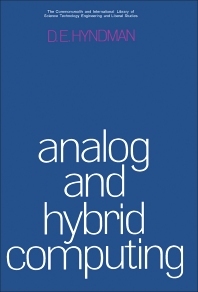 The book is a vital reference for readers interested in studying the operations of hybrid and analog computers.